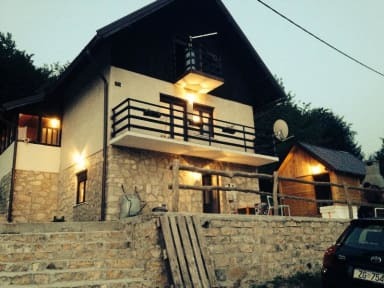 Lovely small, four-room self-catering house with big garden and large outdoor terrace, which provides a high quality experience for budget-aware tourists and backpackers in the heart of beautiful national park Plitvice Lakes. I can’t recommend this place highly enough. Everything was well above standard. Leo was lovely and extremely helpful. Would go back in a heartbeat. Absolutely lovely place, would recommend it 100%! Just a wonderful place to stay. Stay here! Solo traveler here who booked a bed at this hostel. It was a great experience and Leo was an amazing host! If I go back I’d definitely stay here again. I made a few friends here and we hiked the lakes together. It was a great atmosphere all around. Superb stay. Met other bikers. The guy who runs the hostel is super friendly and takes you to the National Park and picks you up. Good facilities and a social kitchen/lounge with a nice balcony area. Will definitely be returning. 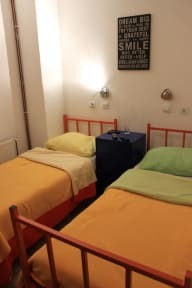 Had the most amazing stay in Croatia at this hostel. Leo is fantastic. When I arrived at entrance 2, called him, and he picked me up. Everyday he drives the guests to the lakes at 8am and picks everybody up at 4pm, and then he takes you to the market daily, if you need. And he drops you off at the bus stop, wherever you go next. I guess I was very lucky with the bunch of people I met here, but we were always hanging out after arrival from the lakes to talk about our experiences. Really good!!!! Very nice hostel! Leo is an amazing host, he drives everyone to the park in the morning and back in the afternoon and to the grocery store in the evening. The atmosphere is also great and everything is very clean. I can recommend this place 100%. Great hostel!! Leo, the owner, is very helpful and accommodating! The hostel has a sunny terrace and garden to relax after hiking! Very nice hostel. More like a home. However, location is a bit far from the nearest bus stop. Location is also very far from the nearest grocery store, however, the host is very kind to have a daily 7pm outing to the nearest market if you'd like to buy food for the night. Early check out as everyone will be heading to Plitvice Lakes and the host provides the shuttle. A very welcoming owner and very friendly. However, too sad that the owner decides to close the backpackers in the future.